Scattered throughout The Summerlands, you will find Ogham Stones marking the location of each of our different sites. In ancient times, these stone pillars would have place names, boundaries, blessings, or other information carved into their sides/edges in the ancient Celtic symbol-language known as Ogham. On our maps, these placemarkers are represented by the white stones. To go to the site of your choice, just click on its white stone. 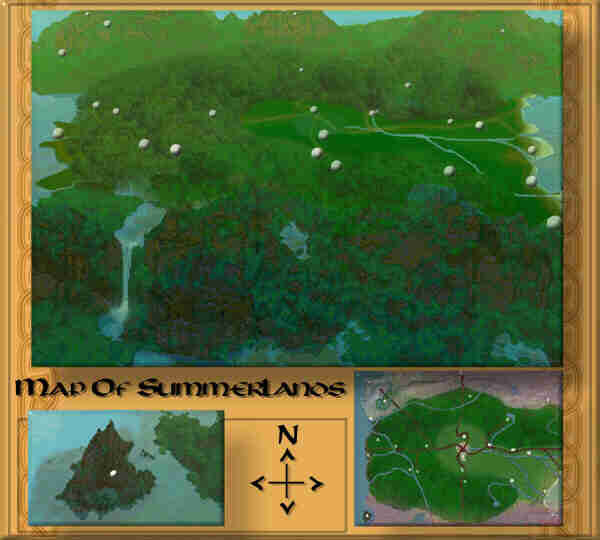 The Map shown above will take you to either the informational paragraph about a "yet to be completed" site or it will transport you to an available site of The Summerlands. with any thoughts, questions or suggestions.